Today we’d like to introduce you to Mitsuko Ito. Mitsuko, let’s start with your story. We’d love to hear how you got started and how the journey has been so far. Human bodies and minds have always fascinated me. I have always wanted to work with people to better their lives. Having moved internationally, finally when I found out that we’re likely to stay in the US as a family, I decided to become a massage therapist as a way to gain solid “hands on” skill (literally) to start working with clients right away. Very quickly, I found that I am able to find client’s pain points with great accuracy, and eventually found that the same thing can happen on an emotional level as well. Clients who suffer from pain in vulnerable areas, such as the jaw, neck, pelvic region, can sometimes be locked into chronic pain which medical science has yet to fully offer a cure. As someone who grew up with chronic pain myself, I had a head start in knowing what it means to have pain, and how to work with those. However, just physically removing tension from client’s body has its limits, as effective as they were. If the clients were under much stress, it was clear the care provided was not enough. Also, I’ve come to strongly agree that stress was the biggest factor in what causes the connective tissues and muscles to tense up, thus leading to pain. 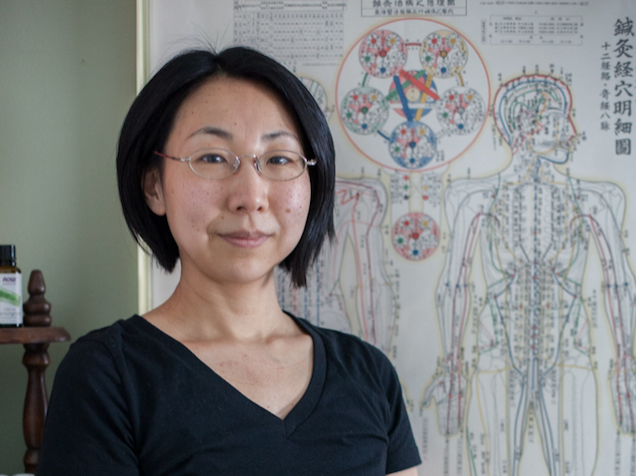 The more I studied what would be the most helpful way to support my client’s wellbeing (as well as myself), I have repeatedly been pulled back to study more of the Asian literature and Alternative Healing methods outside of medical science. I have also come across a modality called Emotional Freedom Techniques, a Meridian Tapping method that utilizes the ancient wisdom from the East, combined with the latest western neuroscience findings. This has proven to be a wonderful and effective tool in managing, reducing or even, eliminating stress in our lives. Nowadays, this is my main focus. I am able to facilitate clearing of mindset and energetic blockages that keeps clients from achieving their best self. This can be applied to physical healing as well as business/personal growth. Equipped with the different tools and modalities, today, we as a team, can offer quite a wide range of services for those looking to getting over their chronic issues in a holistic way. My journey has been the journey of figuring out how to relieve myself of my own pain. Often, we alternative healers are doing what we do, as this is what has allowed us to be who we are today. It is my joy and honor, to be able to share what has worked for me, which I believe can support many other clients, especially those who are eager to create change and are ready to put in some effort. Atlanta TMJ Massage, EFT & More – what should we know? What do you guys do best? What sets you apart from the competition? I provide emotional, energetic, physical healing support to clients who suffer from Emotional Pain. For those who are looking for a myofascial trigger point therapist to help them get started with their healing for their physical pain, I am happy to work with them as their advisor. I am known to get right to the pain points, and help clients release the deep tension that has been stored within them, and know where/how else they can get the support they need. I am proud of our presence, being able to provide competent support and changes that the client desires even in the most difficult situation. If the clients desires for exponential growth, that is a reality as well. The time needed to get to the core issue for us is much shorter than many others. We are also able to blend in many different modalities to fully customize the session to the benefit of each clients. Each session we have is sacred and unique, and I feel a great deal of gratitude being able to help clients release their blockages. I do love it when clients have the “aha” moments where everything starts making sense. Also, when they feel the big drop of tension and relief they have harbored for years, if not decades, they beam with internal joy and confidence. Those are surely moments I am proud of the work I do.